As winter approaches, many Indiana homeowners start to consider ways to save money on energy and reduce heat loss. One of the best places for a homeowner to look at energy savings during the winter months is the crawl space, which then raises the question as to what is the proper way to insure your crawl space contributes to your homes energy savings and not the other way around. To properly answer this question we must first understand a little bit more about Indiana crawl spaces in general. Most vented Indiana crawl spaces tend to be very wet, damp environments. The dirt floor of these crawl spaces also continuously has moisture escaping out of it and moving in an upward motion into the crawl space and up into the living areas (Stack Effect). Because of this, just simply installing fiberglass insulation in your crawl space without address any of the moisture issues can actually lead to more problems down the road and here's why. Fiberglass insulation installed in the crawl space between the floor joist will tend to act like a sponge for moisture that is escaping out of the dirt crawl space floor and working its way up through the house. This in turn allows the fiberglass insulation to absorb that moisture. Many times this makes the fiberglass insulation much heavier and runs the risk of falling out from between the floor joist and on the damp crawl space dirt floor. Fallen insulation in your crawl space can then become a problem for possible mold growth. The other, and sometimes more severe issue with fiberglass insulation holding moisture, is if the fiberglass insulation does not fall from between the floor joist. If the insulation remains installed between the floor joist and continues to hold moisture, then that moisture will eventually begin to effect the structural wood on the floor joist. Prolonged high moisture levels in the floor joist will eventually lead to costly issues such as mold growth or wood rot. Because of these possible issues the real question becomes whether or not you should use fiberglass insulation in your Indiana crawl space at all? My answer to that would be a cautious yes, just as long as the homeowner has had the crawl space inspected for any excessive moisture issues that may effect the fiberglass insulation. If the crawl space is found to have issues with excessive moisture than the following solutions should be considered prior to any installation of fiberglass insulation in your crawl space. 1. Drainage/Sump Pump-If excessive moisture in your crawl space is being caused by standing water in your crawl space then the first step would be to install a proper sump basin and sump pump. Depending on the amount of standing water that the crawl space gets, a complete crawl space drainage system may need to be considered as well in order to keep the crawl space free of standing water permanently. 1. Vapor Barrier-Installing a proper vapor barrier across the entire dirt floor of your crawl space should be the first consideration when dealing with excessive crawl space moisture that is not being caused by standing water. 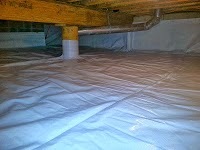 A proper crawl space vapor barrier works by trapping the moisture escaping out of the dirt floor, keeping it from moving up into the crawl space and becoming absorbed by the fiberglass insulation. 2. Crawl Space Encapsulation System-Sometimes a vapor barrier alone may not reduce the moisture levels in your crawl space to an acceptable level. This tends to be the issue when there are other factors contributing to the excessive moisture other than just the dirt crawl space floor. These other factors can include foundation block seepage or excessive moisture being caused by outside air coming into the crawl space from the crawl space vents. If these other factors are playing a part in the excessive moisture issues of your crawl space then a complete crawl space encapsulation system may need to be considered. A crawl space encapsulation system works by sealing the crawl space off from all of the outside environments, which in turn creates a barrier from all areas that are contributing to the excessive moisture rather than just the dirt crawl space floor.